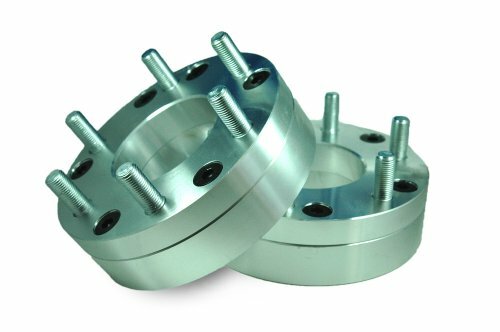 These two piece conversion type wheel adapters are used to convert 8 lug vehicle with 6.5"" (165.1mm) bolt pattern to fit wheels with 6 lug 5.5"" (139.7mm) bolt pattern. They will space out your wheels for 2-inch to help you get enough clearance for wider tires and rims. CNC machined with precision craftsmanship using 6061 T6 aerospace quality billet, featured in high load capacity and corrosion resistance. High quality studs are pre-installed. Sold as a pair for 2 wheels. Order 2 pairs for all 4 wheels. Special Note: They do NOT work on manual or locking hubs. These hubs usually stick out a few inches and will protrude outside the inner piece adapter; thus not allowing the outer piece adapter to be installed. Unscrew and separate the two adapter pieces first. Install the inner adapter piece using short open end lug nuts with no more than 13/16"" hex. If hub studs protrude outside the inner adapter piece and prevent the outer adapter piece from sitting flush, it is required to shorten the factory studs. Bolt outer adapter piece to the inner piece using provided black allen bolts. Install your wheels to the studs of the outer adapter piece using proper lug nuts that both match the thread size of the adapter studs and the seating style of your wheels. If you have any questions about this product by ezaccessory, contact us by completing and submitting the form below. If you are looking for a specif part number, please include it with your message.